How can you make the most of your Chamber of Commerce. Many of us belong to our local Chambers of Commerce. We can all use tips on how to be effective so when this was sent to me, I decided to publish it. Thanks to the Rensselaer County Regional Chamber of Commerce located in Troy, New York . Staff Picks: What is one networking tip you’d like to give chamber members? Laura Amos, Accounting Assistant: Asking questions and making eye contact will let someone know that you are interested. Debbie O’Donnell, Executive Assistant: Seek out those people who are by themselves and look uncomfortable. Be prepared with a few standard questions to get the conversation flowing. CJ Harkola, Membership Manager: Be yourself. Join or form a networking group, preferably start with a small group & grow it. While you are growing it, give back to the community! Kate Ollier, Programs & Events Manager: Be yourself – being genuine is a quality that aligns itself with credibility. The more you’re “You” while still being professional, the more everyone will see you as credible, authentic and a good person to do business with. It will take you far. Stephanie Scully, Controller: Don’t hesitate to talk with other members. They are all terrific. Claudette Thornton, Vice President: Smile. And remember, everyone is there for the same reason you are. Don’t be afraid! Chyresse Wells, Communications & Marketing Coordinator: Be yourself and ask genuine questions to learn as much about their role within their organization as possible and take note of how you may be able to help them in the future. Don’t forget consistent eye contact, and always smile! Lisbeth Calandrino helps businesses build customer service and sales strategies. She is a member of the Rensselaer County Regional Chamber of Commerce. Are You Making or Losing Customers? Without customers you are out of business, period; if you don’t market to your customers you will lose them. It all makes sense to me, or do I have it wrong? I went to a women’s group yesterday, sort of a lunch and learn. I spoke with two new business owners who told me they didn’t have a marketing budget. When I asked why they remarked as soon as I get some business I will have money to market. Huh? I understand that things are tough but things will doubtfully get better for you if you don’t market. Look at it this way. You get a call from a potential customer who asks to see your press kit or your brochures or your testimonials; yes they’re all part of your marketing tools. Or they ask for your business cards and yours aren’t the greatest or consistent with your brochures. Will the customer want you to work for you? I don’t really know but marketing needs to be included in your plan if your business is going to get off the ground. Despite definitions about what it is, no business can succeed without it. It doesn’t matter where you start, how you do it, you will need relationships to succeed. Relationships with potential customers who want to know you’re professional. You can build them on or off line; it depends on you, whichever works. Here are some not so simple tips for your marketing that will help you get started. What do you do that makes you different? Often referred to as your competitive advantage; according to Jack Welch, if you don’t have one you can’t compete. This is a good place to start without it you will end up lumped in the field of sameness. Maybe you provide the same services as others; maybe you do it in a different way. That’s what makes you different. So if you’re starting with the 90 second elevator speech starts with the value and then gives your service a name and a category. Instead of saying you’re a printer, start with the exciting things you’ve made in the past or can make and then say you’re a printer. Also make whatever you do easy to understand. You can’t do it all no matter what you think. Just as customers are trying to decide if you’re the right vendor, you should decide if they’re the right customers. When people start their businesses they think that anyone who walks through the door is their customer. This is the hit or miss, throw some against the wall theory eventually you will get tired of the unprofitable customers. Why not decide upfront who’s profitable and go for them. It will save you time and money. Select your customers carefully, look for partnerships. Customers are flattered by this approach. Create a checklist of attributes for your partners. Have you customer write why they bought from you on the back of their business card. A simple testimonial goes a long way. Call one customer a day just to keep in touch. Consider at the end of the year that’s 365 customers who have had a personal experience with you. Don’t call for anything other than to see how they are and to update your files. You “one customer” might have a referral for you. Don’t forget to ask for a testimonial while you’re service is still hot. I think that businesses are intimidated because they can’t spend money to create the best web site, the best blog, Facebook or Twitter accounts. Nonsense, this is the way you keep yourself from being successful. Start getting involved online; instead of talking to people who haven’t gotten business and think it’s a waste of time talk to those who are doing business. You can be sure your competitors will not talk to you about how much business they’re doing on line. And on line is mostly free. Start a discussion on line or post a question. I know I’m not the best writer but I believe I have a message that is useful so I plug away at it. For years I was told I couldn’t write and so I didn’t had it edited over and over again. If you’ve got a good message, people will listen. When you truly put your customer’s interests above your own you become a team member, a consultant, a partner for your client. Help them determine what they really need instead of trying to sell them anything. This is true customer service. 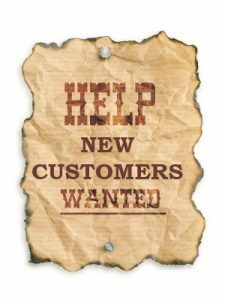 Help your customer find other partners that will help them grow; in the process you will find new partners. Give the best guarantees possible; the absolute best. Give money back warranties whenever possible. This is the age of transparency and being personal. Send a handwritten note, a link to your page, or give a free eBook. Why not? Ask people to review your book and post their comments; review an article you’ve written or a fund raiser you’ve hosted! Post surveys of way your customers think about your service or a special award you’ve received. Did you just run a race for charity? You don’t have to win to post you were there supporting the cause. Write articles for magazines in your industry or in your home town. Get the word out. Whether you are high tech or need to use the shoe leather approach to your marketing, determine the best methods for you to create prospects and build relationships on a regular basis. The main secret of successful marketing to get started , keep doing something on a regular basis and get yourself in front of the decision makers. Like many of you, I am working harder than ever to maintain the level of business this year versus last. As I work on the core of my business – consulting, training, writing books, etc. – I am always searching for new revenue streams. Who isn’t looking to make more money? My search led me to look into the field of direct selling. I know what you’re thinking: "What’s Lis gone off and done now?" Hear me out. Direct selling, also known as multilevel marketing (MLM), is sometimes confused with what people call "pyramid schemes." According to my research, although seemingly the same, direct selling and pyramid schemes are very different. By definition pyramid schemes rarely involve a product of value. The income from a pyramid scheme comes primarily from the recruiting of other associates. On the other hand, multi-level marketing is a marketing strategy that compensates promoters not only for product sales they personally generate, but also for the sales of others they introduced to the company. With multilevel marketing, you can continue to make money by selling the product even if you never recruit another person. The products and company are usually marketed directly to consumers and potential business partners by means of relationship referrals and word of mouth marketing, basically another form of retail marketing. In a 2007 Wall Street Journal interview, economist Peter Vander Nat stated, "If people are buying because they want to use a company’s products, those sales can count as retail. So now I'm wondering is, could network marketing simply be another retail business without a store? The most recognized MLM businesses have been Amway, Avon Products and Tupperware, to name a few. These days, you see MLM businesses for all kinds of products and services. Health and wellness is a huge MLM segment (think Herbalife, Melaleuca, etc.). The majority of direct sales companies use a compensation plan where the seller is paid not only for their own sales, but also a percentage of the sales of other representatives they introduced into the organization and helped train. The key to success in any MLM business is in duplicating a system and then leveraging that system through the work of other associates on your team. You do not need to be successful sales professional to be successful in direct selling. The World Federation of Direct Selling Associations reports that its 59 regional member associations accounted for more than US $114 billion in retail sales in 2007, through the activities of more than 62 million independent sales representative. The United Sates Direct Selling Association reported that in 2000, 55% of adult Americans had at some time purchased goods or services from a direct selling representative and 20% reported that they were currently (6%) or had been in the past (14%) a direct selling representative. You can see why the multi-level marketing industry has experienced growth in each of the last 20 years. I can’t think of any other industry that can say the same. The second part of this recipe for success involves the explosion of the Internet. Every day over 100 million videos are viewed on YouTube. In the last 5 seconds, 10 million emails have been sent! According to a New York Times article, overall, 57 percent of Internet use was devoted to communications like e-mail, instant messaging and chat rooms, and 43 percent for other activities including Web browsing, shopping and game playing. Users reported that they spent 8.7 percent of their Internet time playing online games. I guess what it says is that people are online. Direct selling has seen entrance into the world of email, video and the video email business. What’s next? Stay tuned for my experience with direct selling and new technology. Several weeks ago I was invited to speak at Carpet Network’s Homecoming 2009 in San Antonio, TX. Carpet Network is a shop-at-home franchise founded in the early 90s by Christine and Lenny Rankin. At the time they had a very successful floor covering store and decided to take their concept to the next level. It was obvious to Chris that it was often difficult for customers to make decisions in the store. It was much easier when the customer looked at the products in their own home. "With that," says Chris, "the shop-at-home concept that was to be Carpet Network was born." Chris continues. "At the time, when retail stores are struggling to survive, our mobile concept is booming. Our state-of-the art Unicell vans allow our customers to view thousands of carpet, floor and window covering selections from the comfort of their homes or business." Just a note about franchised business, they are successful for one main reason: they have a proven system in place. There is no question McDonalds and Dunkin’ Donuts have survived because of their systems. Franchise businesses have a failure rate of only 25% within the first five years, and traditional businesses have a failure rate of about 80%. It’s the system that works. By buying a franchise you are buying into a set system of rules and regulations that have been tested and work. So, what better place to hold a “homecoming” but in San Antonio during Fiesta time. A local nonprofit group or military organization sponsors every one of the 107 official Fiesta events of 2009. Fiesta is one of America’s truly great festivals. It began as a way to honor the memory of the heroes of the Alamo and the Battle of San Jacinto. For over 100 years Fiesta has celebrated the diversity and culture of San Antonio. The theme of Homecoming 2009 for Carpet Network was all about how franchisee members could take advantage of new ways to build their business. Social networking with Facebook and Blogging spurred much great discussion. Facebook seems to be a way of communicating for everyone these days — including the Fiesta — with their page hosting hundreds of comments as well as information on events. With golf events, carnival, great food and music, San Antonio at Fiesta is a wonderful place for a convention. Speaking of social networking, Lenny Rankin, CEO of Carpet Network, gave some interesting facts on social media*. 85% of Americans believe a company should not only be present via social media but also interact with its consumers. 60% of Americans interact with companies on a social medial web site, and one in four interacts more than once a week. 56% of American consumers feel both a strong connection with and better serviced by companies when they can interact with them in a social media environment. The ability to go to the customer is key. You don’t have to wait for the customer to come to your place; you have been invited to theirs. It’s important to be professional and organized. Without a storefront your overhead is greatly reduced. Having a well-equipped mobile showroom is just as effective as a brick and mortar business. People get connected to the person with the products. Not the products or the storefront—but the person. Often times this gets misinterpreted by salespeople. They push their products instead of building their own credibility. You must have good training and support from your home office. Having a good franchise behind you keeping up with trends and providing good back up is key. Great weather, wonderful town and great people; what could be better?